This is basically my Cantonese chicken recipe, which I based on my love of Peking duck. But, for whatever reason, I never tried this recipe on duck before. Recently, I went home to Long Island to visit my Mom, and I stopped by one of the great food stores of my life: Miloski’s Poultry Farm in Calverton, NY. I’ve been coming to Miloski’s since I was a kid. My Dad would buy his ducks there and Grandpa Miloski, the guy that started it all, would serve us. Over the years, grandpa made way for his son, and now the son is retired and the grandson has taken over the business. All along the way, one thing hasn’t changed: the excellent quality of their product. My uncle Antanas passed away years ago, but when it came to being a true foodie, this guy put all others to shame. Besides being the only hunter in our family (my first taste of venison was at his table) he had several huge freezers in the basement of his Richmond Hill, Queens, home back in the day. He would drive to Miloski’s and buy 50 ducks at a time, and bring them home to freeze. Very often, after I finished Lithuanian school on a Saturday, my uncle would invite our family over for dinner, and we’d all sit around a massive table where no less than 5 ducks would be cooked and served, along with all the fixings. That’s just a taste of my Miloski memories. I try to stop at Miloski’s every time I pass through. I bring cash, because Miloski’s doesn’t take credit cards! I have a long ride home, first on the Cross Sound ferry from Orient Point to New London, CT…and then an hour-and-a-half on the highway from there. I bring a cooler and I buy a bag of ice along the way. Miloski’s sells all kinds of exotic meats, like wild boar and ostrich. But I go for their delicious kielbasa, pierogis, and now: duck! 1 whole duck, thawed, about 5 lbs. Rub the soy sauce first all over the duck. (It will absorb the flavors better if you do it before you rub the bird with the oil.) Then rub the peanut oil all over the duck. Rubbed and ready to go in the oven! Combine the Chinese five spice, garlic, salt and pepper in a bowl. Season the entire bird, including inside the cavity, with this mixture. 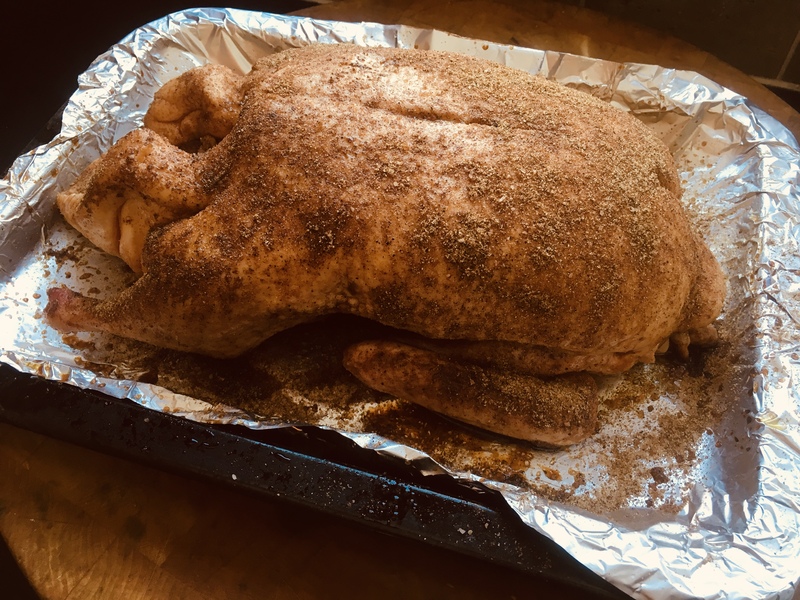 Reduce the oven temperature to 250 once you put the duck in the oven, and then cook it low and slow for up to 4 hours…or more. Meanwhile, combine the hoisin sauce and sesame oil in a small bowl. When the duck is about 15 minutes away from being done, brush it with the hoisin/sesame oil mixture. Cook it another 15 minutes until the bird has a nice dark glaze. 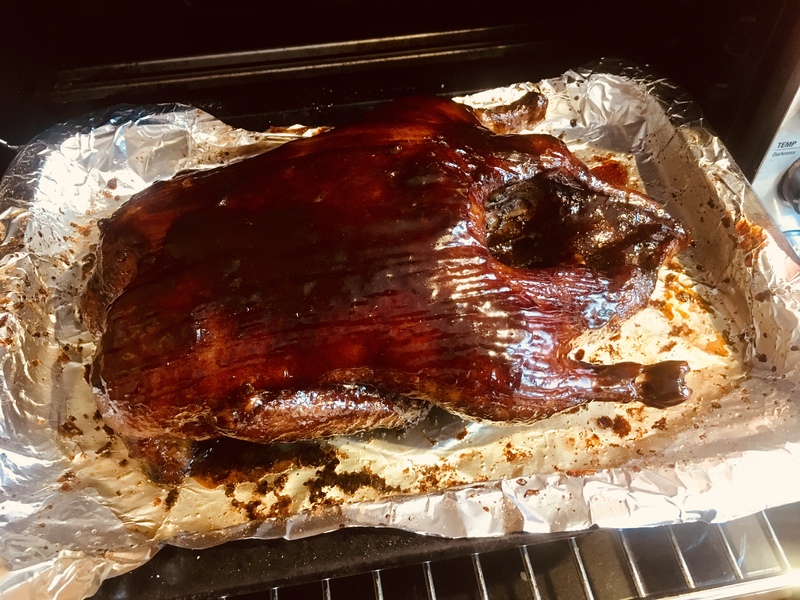 Let the duck rest about 15 minutes before carving. Can you get salmonella from duck? In a word: depends! It used to be that salmonella was only found in the intestinal tracts of chickens. But because ducks are often raised in areas where chicken live, cross-contamination is very possible. Even if the birds live totally separate lives, cross-contamination can also happen in slaughterhouses. So…despite the fact that many say you can eat duck meat that’s pink, I prefer not to. 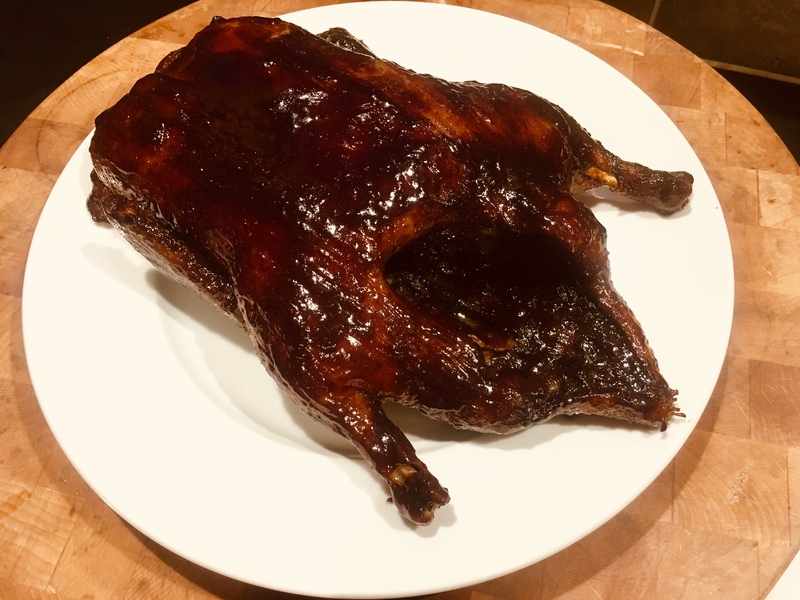 I’ll tell you this: there’s quite a bit of fat in an average duck, so even if you cook the bird to medium-well, it will be delicious and juicy….and the skin will be fantastically crispy. Be safe!